HARTflex to begin April 12! HARTflex is almost here at last! After three years of delay, HARTflex will finally be rolling out in SouthShore and Brandon on April 12. Patrons in SouthShore and Brandon, the first two areas to recieve service, can call a special reservation line (to be announced) and place a reservation. Minibuses then transfer passengers from their homes to their place of business or other points of interest within the service area. HARTflex buses will follow a designated fixed route, but will be able to deviate up to 3/4 of a mile outside of that desginated route. 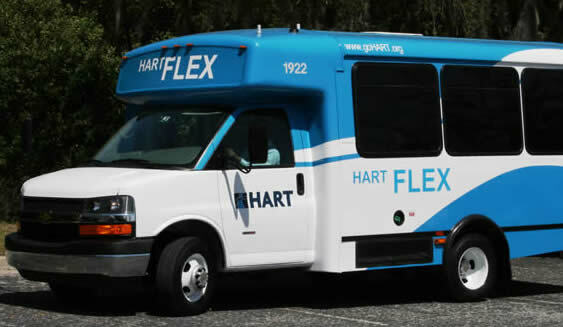 HARTflex service will also connect to HART Local or Commuter Express bus routes to allow for connectivity outside the designated neighborhood zones. Both areas will be served on Weekdays from 6am until 8pm, with Brandon being served on Saturdays from 7:40am until 5:30pm. There will be no Sunday or Holiday service with either route. Click here to view the full article from the HART Website, including maps of both service areas and how you could ride for FREE!